A Jumper Style Coverall, designed to give the full skirt protection that much farm work and gardening requires. Roomy pockets are conveniently placed. The front opening makes it easy to put on and take off. Knee-length leggings are included. One of the problems that the U.S. Department of Agriculture (USDA) had to contend with during both world wars was a shortage of agricultural labor. Men who didn't enlist were recruited to work in industries supporting the war effort, making them unavailable to work their own farms or to work as hired hands. Women stepped up to fill the short fall, sometimes by enlisting in the Women's Land Army, often by taking on more responsibilities on their family's or local farms. Overalls for women started to be marketed during World War I, and women had started wearing trousers in public in the 1930s, generally as sporty wear, so by the start of WWII the idea of women in trousers wasn't entirely new. Yet the USDA seems to have felt there was a need to offer some support for women who needed to do dirty agricultural work but weren't ready to wear trousers or overalls. A sturdy apron and leggings were apparently seen to be a workable solution. Here's a terrific image of women at the USDA designing work clothes for women at this period. 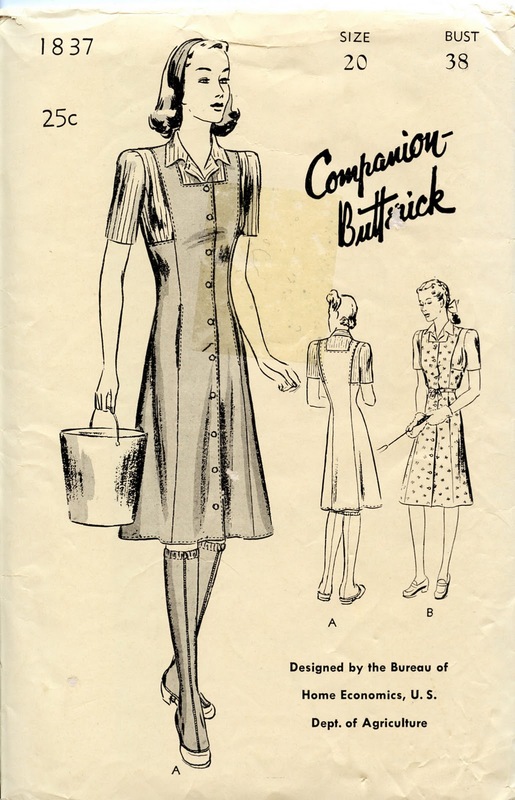 Many thanks to Jim Christensen for pointing out that this very ensemble was described and illustrated in Clarice Louisba Scott's book Work Clothes for Women, issued by the USDA in June, 1942. 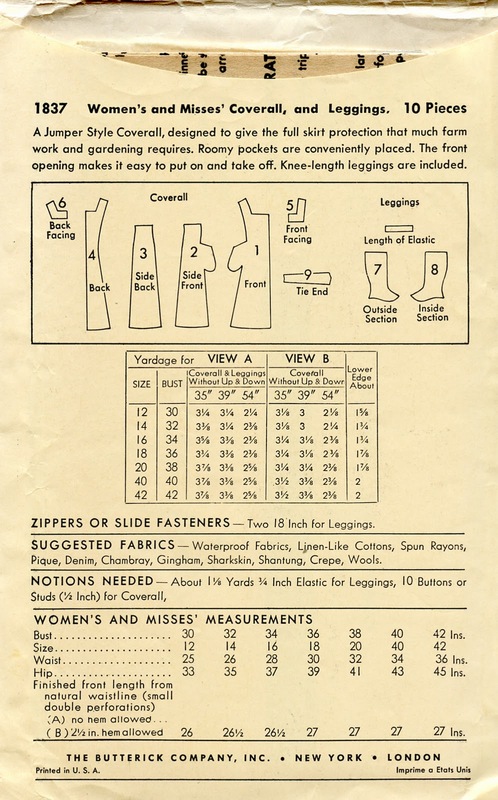 By WWII "coverall" is a fairly common term for this type of apron. ("Overall" seems to have been used in Great Britain.) Patterns for leggings for girls show up throughout the '30s and '40s, usually as part of a winter ensemble including a coat and hat. This is the first time I've seen a leggings pattern for women. The option to use 1/2" studs (snap fasteners) is uncommon. This is an unprinted pattern and does not appear to have been used. Originally published on 21 January 2011, updated with additional documentary evidence on 23 January, 2011. This was a very interesting post. I wonder how well those leggings stayed up while the women worked? I was also surprised that the pattern itself was in a larger size. Wow, how fabulous! Thanks for the info on early workwear. Great post! Mona I wondered that myself about the leggings. They have elastic around the top, so if you got your elastic just right, I imagine they'd be about like knee socks, which is to say, I'm sure they slipped after a while and you'd need to give them a yank. There is also a strap under the foot to keep them from twisting. The nice thing about the more utilitarian patterns is that they do tend to come in a wide size range. I adore this apron! How practical and pretty! A lot of what we get today in the way of work garments are so ugly. VERY COOL! I love it!!!!!!!!!! Another pattern I wished I owned myself... at first I thought the coverall had sleeves and a collar and was meant to appear as a jumper, but now I think it's a sleeveless garment and the sleeves/collar are just the wearer's regular duds underneath... am I right? I actually think those "leggings" would be a really useful addition to my own wardrobe, since I wear dresses all the time.